Packaging should be light, visually appealing, and microwavable; they ought to present the content well, help to increase the durability, and contain the intensity of flavor over a long period of time. Accordingly, the pressure on film producers to meet the continuously rising requirements regarding optics, handling and barrier properties, as well as conservation of resources and sustainability is high. Requirements increase also for agricultural and other films. In defining the individual products, all kinds, from wafer-thin films to thick, rigid boards, can be found. The new study by Ceresana focuses on flexible films. Besides the trends of the consumer goods market, numerous other factors influence the demand for plastic films on several national markets as well. Many EU countries in particular try to contain the demand for light-weight carrier bags. The implementation of the respective regulations, however, varies considerably from country to country. In contrast, demand for secondary and transport packaging such as shrink and stretch films depends on the macroeconomic development and the consumer climate of the respective country. In some countries, the efforts to intensify agriculture propel the use of agricultural films. The demand for construction films corresponds to the order situation of the respective construction industry. 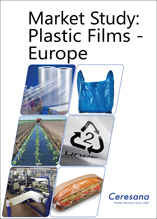 Chapter 1 analyzes demand and production as well as revenues in regard to plastic films for 25 countries. Furthermore, the study analyzes the demand for plastic films split by the several plastic types as well as split by the individual application areas. Chapter 2 offers a detailed presentation of various application areas of plastic films: Data on demand development in the applications packaging films, bags & sacks, shrink & stretch films, agricultural films, and other films. Chapter 4 provides company profiles of the largest manufacturers of plastic films – clearly arranged according to contact details, revenues, profit, product range, production sites, and profile summary. Extensive profiles of 87 manufacturers are included, such as Exxon Mobil Chemical Company, DowDuPont Inc., Mitsubishi Corporation, Saudi Basic Industries Corp. (SABIC), Toray Industries, Inc, Evonik Industries AG, Covestro AG, Bolloré Divisions Films Plastiques, Amcor Ltd., Eastman Chemical Company, and Constantia Flexibles Group GmbH.